The sharpest, most stylized, and ambitious anthology of Native American literature ever published. Brand-new stories by: Mistina Bates, Jean Rae Baxter, Lawrence Block, Joseph Bruchac, David Cole, Reed Farrel Coleman, O’Neil De Noux, A.A. Hedge Coke, Gerard Houarner, R. Narvaez, Kimberly Roppolo, Leonard Schonberg, and Melissa Yi. With a foreword by Richard B. Williams, president & CEO of the American Indian College Fund. STEP INTO INDIAN COUNTRY. Enter into the dark welter of troubled history throughout the Americas where the heritage of violence meets the ferocity of intent. The protagonists of these stories—whichever side of the law they’re on—use their familiarity with Indian cultures to accomplish goals ranging from chilling murder to a satisfying participation in the criminal justice system. AUTHORS WITH INDIAN HERITAGE or blood join non-Indian authors in creating stories in settings as diverse as the terror-ridden atmosphere of the Indian boarding schools to the dubious sleaze of contemporary casinos. SARAH CORTEZ (co editor), a law-enforcement officer, is the award-winning author of the poetry How to Undress a Cop. 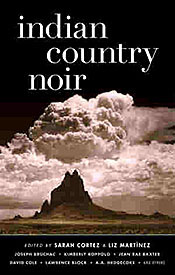 Cortez co edited with Liz Martínez the fiction anthology, Hit List: The Best of Latino Mystery. She brings her heritage and blood as a Tejana with Mexican, French, Comanche, and Spanish blood to the written page. Launched with the summer ’04 award-winning best seller BROOKLYN NOIR, Akashic Books continues its groundbreaking series of original noir anthologies. Each book is comprised of all-new stories, each one set in a distinct neighborhood or location within the city of the book. A Trade Paperback Original, Fiction/Mystery Anthology. Book events featuring the editors and select contributors TBA.